How to Recover Deleted Music/Songs from iPhone 6S/6 Plus/5S/5/4S? One of the largest and most common mistake that leads to music loss on the iPhone is human error. People are not perfect and from time to time due to carelessness or lack of information. For example, you may accidentally delete a music file you like, or download music but disconnect the internet connection before it finishes. Majority of music losses usually occur because of system or hardware failure. iPhones are man made devices which means that they are susceptible to malfunctioning from time to time. For example, the disk storage may become corrupt therefore damaging the music making it unplayable. iPhones have music playing apps and are powered by an operating system that acts as an interface between the hardware and the user. Since music apps are developed by software engineers, they are bound to have bugs which means they will malfunction from time to time. This can destroy data such as music therefore leading to loss. From the above, it seems that such music loss sufferings are very common. Then, is there any possible way to recover lost, deleted or corrupted music files from iPhone? As a matter of fact, chances of iPhone music recovery tools like Coolmuster iPhone Data Recovery or iPhone Data Recovery for Mac is here to provide iPhone users with the right solution. This is an application that allows the user to recover lost data which may have been deleted by mistake The application is compatible with various Apple products such as iPhone, iPad and iPod. It is designed to recover several types of data even from a damaged or broken iPhone, such as call history, contacts, messages, notes, safari data, voice memos and photos among others by scanning the iTunes back files for your iOS devices and help you regain them via Windows OS or Mac OS X. The application provides a 100% safe solution which provides a reliable way to find lost and deleted data. It can also be used on offline network situation. It has no spyware, adware or viruses that will compromise your computer. 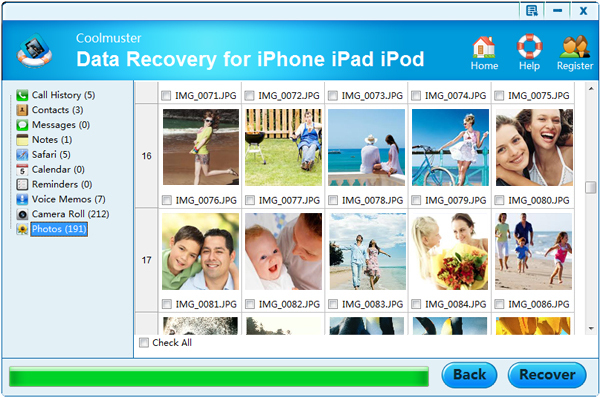 Below are steps of how to use the Coolmuster data recovery for iPhone application. Install the iPhone Data Recovery and run it by double clicking on the desktop icon. It will scan your computer to find the backup records for all your iOS devices and show them on its main interface. Select the backup of your iPhone and hit "Start Scan" to scan the files in it. Scan all iPhone back up files by opening the file categories and preview the contained data. Here, you can directly open the "Music" folder and then mark the music files you would like to recover. Click the "Recover" button and there will be a patch choosing dialog pops up, asking you to select a specific folder to save the recovered iPhone music files. Then, the iPhone data recovery application will automatically to finish the task.